November 4, 2012 March 4, 2013 ~ M.
On Sunday a small group of us decided to get together and hit the Benchmark WOD, Filthy Fifty. A way to celebrate turning back the clocks and welcoming in the season of hibernation. The last time I did this WOD was way back in January. It has been a while. Seemed like a good time to revisit, especially with a small group of close ACF peeps in the calm of a Sunday afternoon. What a great day it turned out to be. With a Pandora mix circa Pink playing in the background, I completed the WOD in 32 minutes flat. 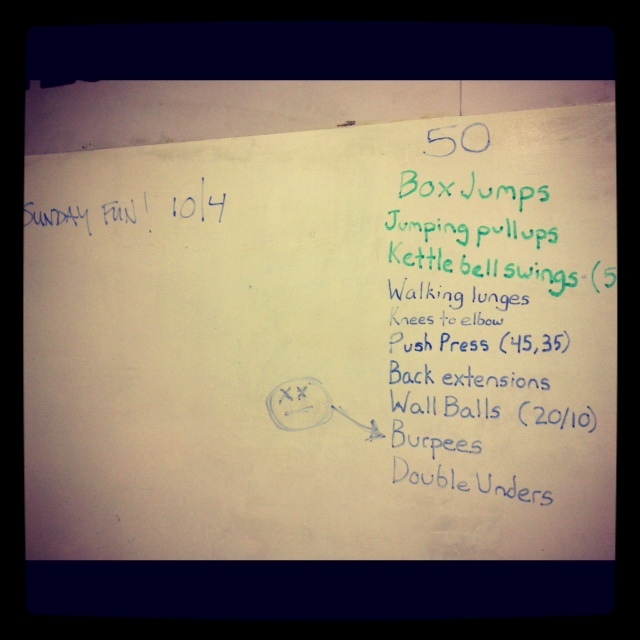 Scaled to 20″ box jumps, jumping pull-ups, Kettlebell swings at 35lbs., Wall Balls at 10lbs., and 100 single-unders.